Rakat e Taraweeh is an Islamic Urdu book about the 20 Rakat of Namaz e Tarweeh. This books was by Maulana Habib ur Rehman Azmi. A spectacular answer to the Ghir Muqallideen. Visit the below mentioned links to read online or download the complete book in Pdf format. 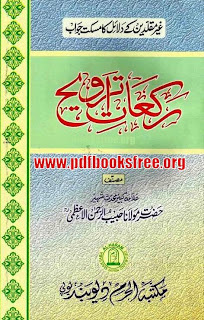 Download free pdf books,Top Islamic Books, Islamic History Books and Novels, Urdu novels, Romantic novels ,Urdu fiction books , History books, Horror novels , Urdu poetry books ,Pashto Books, Pashto Poetry, Adventure novels , Jasoosi Novels, Purisrar Novels, Tanz o Mazah,Crime stories, Islamic Wazaif in Urdu, Hadith Books,Cricket Books, Health and Medical books, English Books, English Novels and Much More.